When designing a dental clinic, consider function, accessibility of key areas, and aesthetics. All activity revolves around the dental treatment rooms; therefore, key areas such as sterilization, laboratory, darkroom, and reception should be located to allow the most efficient movement between them and the treatment rooms. A more detailed description sterilization bay design is provided on page 22 of The Patient-Centered Dental-Health Home: An Essential Guide for Planning the CHC Dental Facility Expansion. Also, the dental clinic must be accessible to patients and staff who have disabilities; this needs to be considered in the design phase. 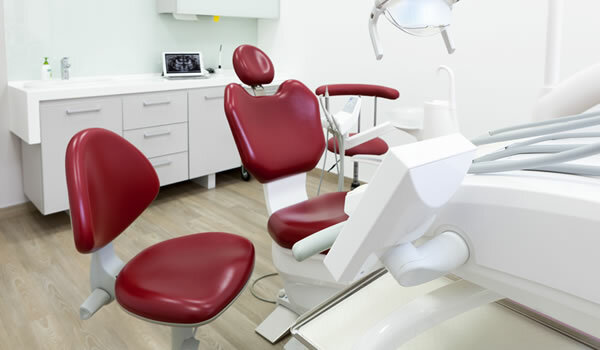 Dental equipment manufacturers can provide you with floor plans, similar to the samples provided here, to best utilize cabinetry and equipment for your purposes. Henry Schein, Inc., a dental supply and equipment company, and A-DEC, Inc., a dental equipment manufacturer, provided the floor plan options below. There is no “perfect” clinic layout, but the basic principles presented in this unit should be followed when designing your clinic. Err on the side of more staff and storage space. These layouts should be shared with dentists who will be working in the clinic, the architect that will be doing the construction drawings for the clinic, and other staff that will be working on the clinic design.